Each of 100 mini-game environments respond to stress levels measured by your heart rate and finger sweat —alloWing you to control the audio and visual environment with your mind. Particle Editor has been proven in clinical settings to be an effective tool for physiotherapists to use with patients of all ages and walks of life. 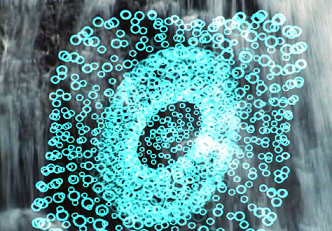 The appeal of the music and visual environments within Particle Editor is universal! Everyone loves the power to have an effect on the world around them. 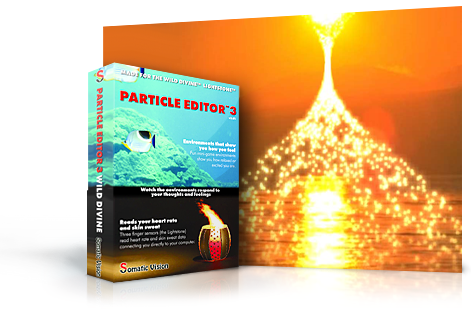 Globally, programs including Particle Editor have helped people improve their ability to concentrate and more calmly advance toward achieving life goals. These programs have also helped people with health advisories or demanding physical careers reduce strain that is regularly put on their hearts. Unique SomaSense™ technology insures that you will see and be able to control your stress level measurements on your first use. Easy-to-use, simple-to-install finger sensors (USB) read heart-rate, heart coherence (HRV), skin sweat and sweat stability. Build, customize and save your own active feedback mini-games.Create, modify, save, load and trade beautiful mini-game environments that respond to heart-rate, heart-coherence and skin-sweat. 20 feedback settings can be linked to 6 physiological measurements for millions of feedback combinations. Choose from over 30 professional music pieces or load any .mp3 that you own. Huge background and particle image library lets you easily create new, personalized games! Particle Editor 3 responds to heart rate rhythms and finger sweat changes as measured by USB finger sensors. Heart rate and finger sweat changes are reliable measures of stress and relaxation. Dual Drive may only be used on one computer at a time. Dual Drive can be installed on two computers as long as only one copy of Dual Drive is in use at any given time. "Journey to the Wild Devine"